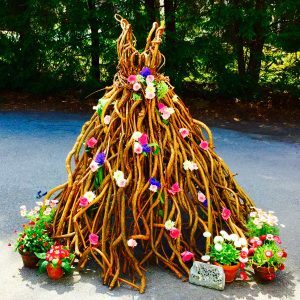 Elegance Entangled Ball Gown Sculpture, A Bittersweet Sculpture of bittersweet vine and steel. Available to rent. Please contact me for details. 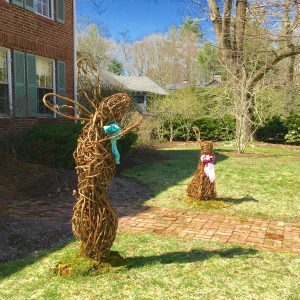 Bittersweet garden sculptures of standing rabbit (5’6″) and seated rabbit (4′). Finished with nontoxic wood preservative. Price upon request, and available to rent. 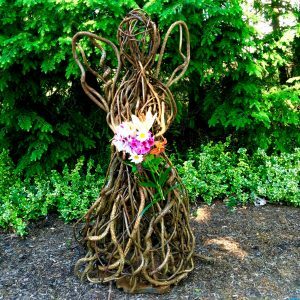 Bittersweet vine sculpture of a Memorial Angel. 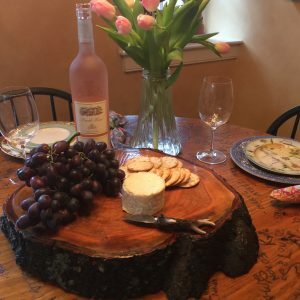 Stunning live edge cherry slices make unique dessert stands or cheese platters, approximately 15 inches in diameter with a food safe finish.